What’s in a name! the Jackhammer slot is going to rock your world. 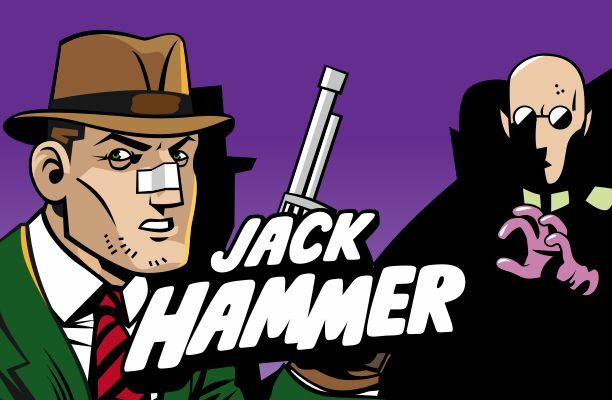 This slot by Netent revolves around a detective called Jack Hammer set in a cartoon style graphics. It’s famous for its so called sticky wins. This is a concept where symbols stick to the reels while you’ll get to do a re-spin if you hit a winning combination. What makes this slot so special is the fact that it’s based on a comic story. The graphics arand the entire slot’s graphics look like you’re reading a comic book. Win money and emerge yourself in the world of your favourite comic pulp fiction, the best of both. The set-up of Jackhammer seems classic with 5 reels, 3 rows and 25 paylines. But that’s probably all that makes it ‘classic’. The design is everything but your standard slot. Both the graphics and style of the slot feel like a comic book and not like you’re playing a slot machine. Each reel is a separated cell, just as a comic book is designed. The rules, features and symbols are easy to understand. 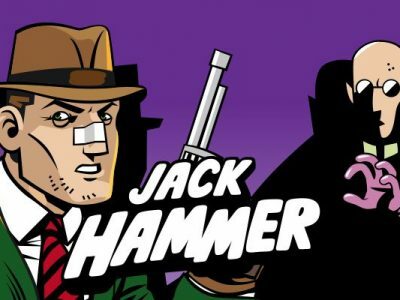 Jackhammer is a slot created by NetEnt, a popular game developed that has been around since 1996. They launched their wonderful Jackhammer slot in September 2010 and it has been a hit ever since. The slot is widely available to play online, even from the comfort of your tablet or mobile phone. One of the most prominent features about the Jackhammer slot is its ‘Sticky Win’ feature, which was briefly discussed earlier in this article. Basically it holds your winning symbols and then re-spins the reels for free. The exciting part in that is that as long as the re-spins result in matching symbols, you keep winning. Additionally there is a Free Spin symbol, which you get to use when you hit 5 or more of these symbols on the reels. Joining in on the fun game of Jackhammer starts with as little as €0.25 per spin or a maximum bet of €250. This allows for a lot of freedom for you, the player, to spend as little or as much as you want. The maximum prize at Jackhammer is €750.000 and the RTP is a reasonable 97%.